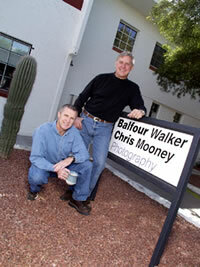 Balfour Walker and Chris Mooney are partners and have been in the business for 30 years and 19 years respectively. 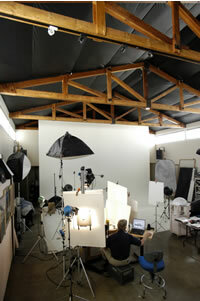 The studio is 5,000 sq feet with a 24' wide x 18' deep x 16' high cyclorama background in a room 36' deep x 32' wide. Six offices surround the shooting space as do the client lounge, editing and print production room. 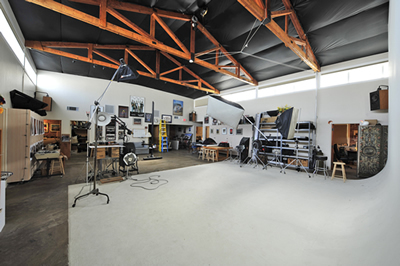 The studio building was completely rebuilt in 2000 and is air conditioned and over-insulated with double paned windows. It is clean and comfortable year round and quiet enough for sound recording for film and video. All offices are Cat 5 wired for sharing and movement of digital files. The studio utilizes both high-end Mac and PC computers. The front portion of the building houses TK Computers, Inc. which specializes in Networking systems and supplies us with Server and high speed 4.5 Mbps DSL . Balfour and Chris each use the latest Nikon digital cameras . In addition we have 2 complete systems of film based 2 1/4 Hasselblad and 4x5 Sinar cameras. Lighting consists of Norman electronic flash power packs and heads, Mole Richardson, Arri and Lowell tungsten lights. 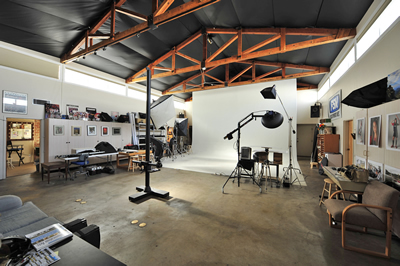 Contact me if you need the use of a great studio for your project.